LectureMonkey now lets you turn lectures you recorded into videos stored in your local picture roll – it will be a regular video with the LectureMonkey logo and the title of the lecture. LectureMonkey can also directly upload those lecture videos to your YouTube channel. You can only transcode and upload lectures that you recorded. Video creation is NOT automatically done for every lecture and is requested through a new menu – the “owner actions” menu which is accessible from the main screen. If you touch a lecture on the right side of the main screen, you’ll get the “owner action” menu if available. If you touch the left side you’ll get the regular playback and edit menu. 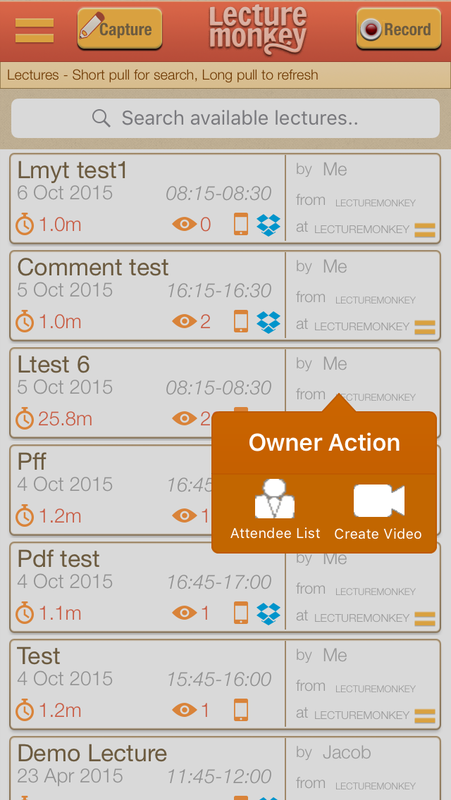 This functionality isn’t available for all lectures – only those you recorded yourself. Owner actions availability is indicated by a menu icon on the right half of the lecture listing ( ). Actually creating the video is simple and automatic. Once you have pressed the button LectureMonkey automatically creates the video for you and puts it in your camera roll. This usually takes only a minute or two. When done asks if you would like to upload it to your YouTube channel. If so, it will ask for your logon credentials and upload it for you. Lectures that are designated private in LectureMonkey will be private lectures on YouTube as well. Lectures designated “university” will be uploaded to YouTube as unlisted, and public lectures will be public on YouTube as well. Here is an example lecture that I uploaded. You can create videos of any length – but to upload you may be limited by YouTube (the YouTube default for a new user is a 15 minute video). If have had a channel for a while, you can remove that YouTube limitation through your YouTube settings. LectureMonkey also has a few cool tricks when uploading to YouTube. The LectureMonkey lecture comments become subtitles as well as a YouTube comment, and LectureMonkey also creates a additional comment for every slide transition. These comments have with a live timestamp – YouTube will advance the video to that timestamp if you click on it. LectureMonkey also adds a link to higher resolution version of the slide. Hope you like the capabilities – enjoy! This entry was posted in 3. General, Blog, Owner Actions Menu, Sharing. Bookmark the permalink.